Security cameras, electrified gates, metallic poles and guns, expensively insured possessions, family and friends who have been mugged, their houses broken in, or cars stolen. Sounds like a horror movie? Try everyday life in South Africa. No surprise, people are trying to get out of South Africa to build their lives from scratch somewhere else, anywhere else, as long as it’s safer. This is why Rüdiger Roach set out to find himself a job abroad. Not only did Rüdiger find a job in his field in Tallinn, his wife is working here, too — and they both started to learn the famously difficult Estonian language. “I had been wanting to live and work outside of South Africa as long as I can remember, already in early high-school. Europe was not on my horizon specifically, but I knew it had to be a safer, better functioning country,” says Rüdiger. 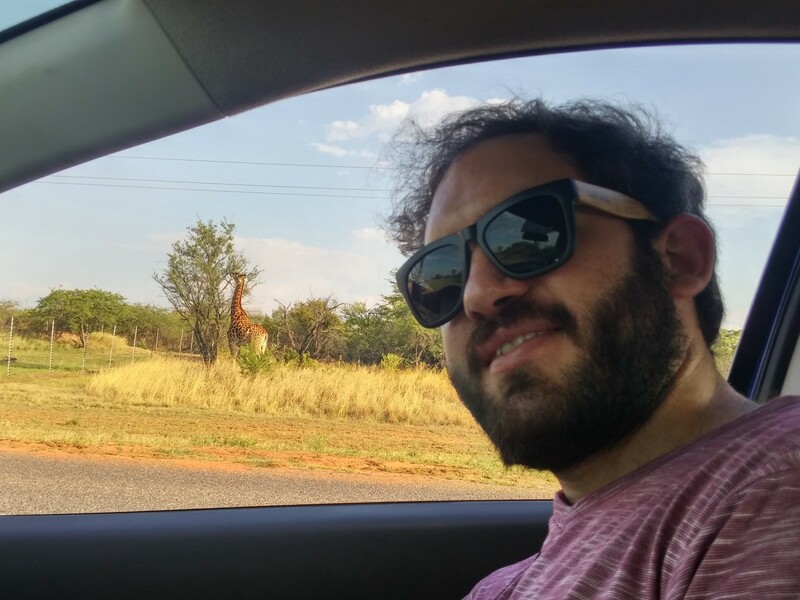 With the goal to move out of South Africa in mind, Rüdiger set the plan in motion and worked three years as a software engineer in a big software house to gain experience. Only then, he thought, he’d be a desirable candidate for employers abroad. Companies all over the world say they want to hire the best but it usually comes down to hiring the best…closest to their office. Luckily, not the ones on Jobbatical — quite on the contrary, these companies are on the lookout for international talent. “Just 1.5 years ago I was living in Pretoria and working at a very good company — they’d won awards for being a good employer — and I had actually just gotten a promotion there. I had the chance to be in my new position for a mere month when I resigned,” Rüdiger says. He’d been constantly looking for sites and places to apply for jobs abroad when his focus turned to Jobbatical. “All the other places where I applied did not want to hire internationally,” he says. Rüdiger applied for a couple of openings in his field. It happened to be Shipitwise — an Estonian startup automating logistics — that first contacted and eventually hired him. Let’s rewind a little. All this wouldn’t have happened if Rüdiger hadn’t had a conversation with his wife Antonel one evening at the end of January 2017. “It seemed we’d arrived at a turning point in our lives and so we asked ourselves: are we going to plan our life in South Africa or go somewhere else?” They decided to move somewhere else, the only criteria being a safer and better functioning country. “We decided it is probably better to go travel the world while we are still young and can absorb failures better. We considered the US because I have family there, we also considered Australia because I have friends there. Finally, the thing that attracted us to Europe was the freedom of movement between the countries.” And this is when Rüdiger started seriously looking for a job. So back to Jobbatical. Rüdiger applied for a couple of openings and got a job offer from Shipitwise. Things really sped up from there. The couple didn’t even have a lot of time for background research. “I mean, we did research Estonia’s crime statistics, and the company I’d be joining,” Rüdiger says. Ah, crime statistics, naturally. “Life in South Africa is of constant hyper vigilance, you have to think everything through: where am I keeping my wallet, how and where are people around me moving, because the threats are real. I don’t know anybody who hasn’t had their house broken into, car stolen, or handbag grabbed on the street. Almost everybody has guns. Selfie game in South Africa is better because giraffes. Photo credit: RR. Rüdiger’s in-laws are white South African farmers. With policy changes in the country that are leading to the expropriation of property without compensation, times are uncertain for people like them. His parents didn’t like him leaving South Africa, of course, although they understood. “They knew it was coming, that it was a matter of time,” says Rüdiger. I must say, these people do adulting way better than I ever could. Rüdiger and his wife decided to travel the world in the end of January. He found a job in a matter of weeks, started the paperwork in February, got all their affairs sorted in South Africa and arrived in Estonia mid-March 2017. Talk about speed! “We got to our Airbnb in Tallinn — that the company got us for the first two weeks — sat on the couch, looked at each other and realised we were not prepared at all,” laughs Rüdiger. 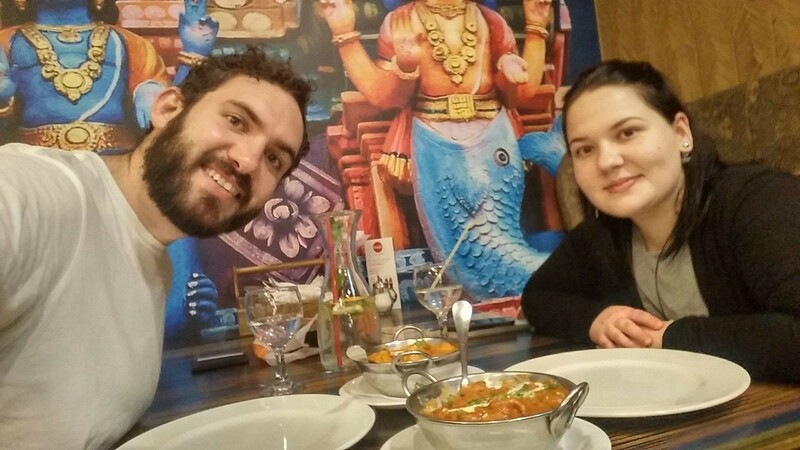 Enjoying some Indian food in Tallinn with his wife. There must be sour cream and pickles somewhere. Photo credit: RR. From what he tells me, the integration pains were not that significant. “According to our research English wouldn’t be a problem. But every second place I walked into, people struggled with English. I must be a magnet for people speaking only Estonian. Understanding stuff in the grocery store was only possible with Google Translate because so many things do not have English labels. Now, a year later we can already survive without Google. This submersion has helped me to learn the Estonian language quicker. And we started studying Estonian through the government subsidized program also, because if you want to integrate into any society, it is only normal to speak the local language,” Rüdiger says. 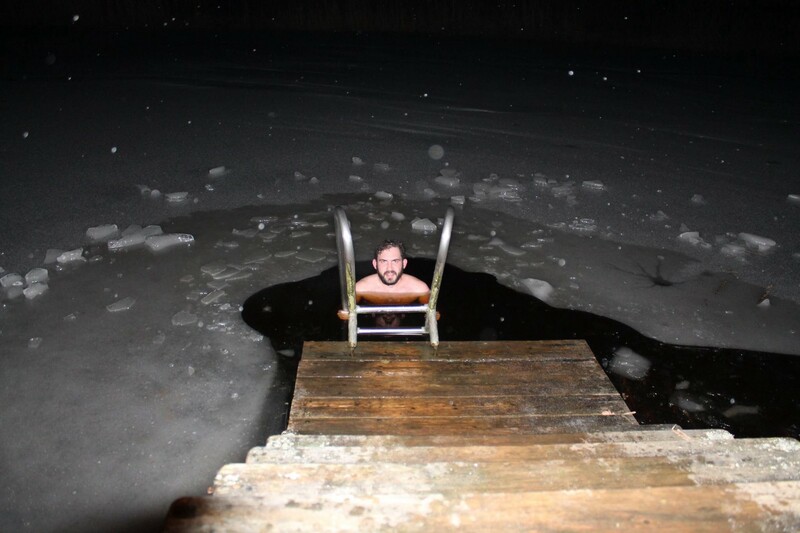 Jumping in an icy lake when you go to the sauna in the winter is something many Estonians do. Rüdiger now, too. Photo credit: RR. Rüdiger’s life at Shipitwise. Photo credit: RR. After nine months Rüdiger left the company. “There were no big issues. It was the natural course of things. They switched their business model — stopped serving customers and focused on businesses,” he says. 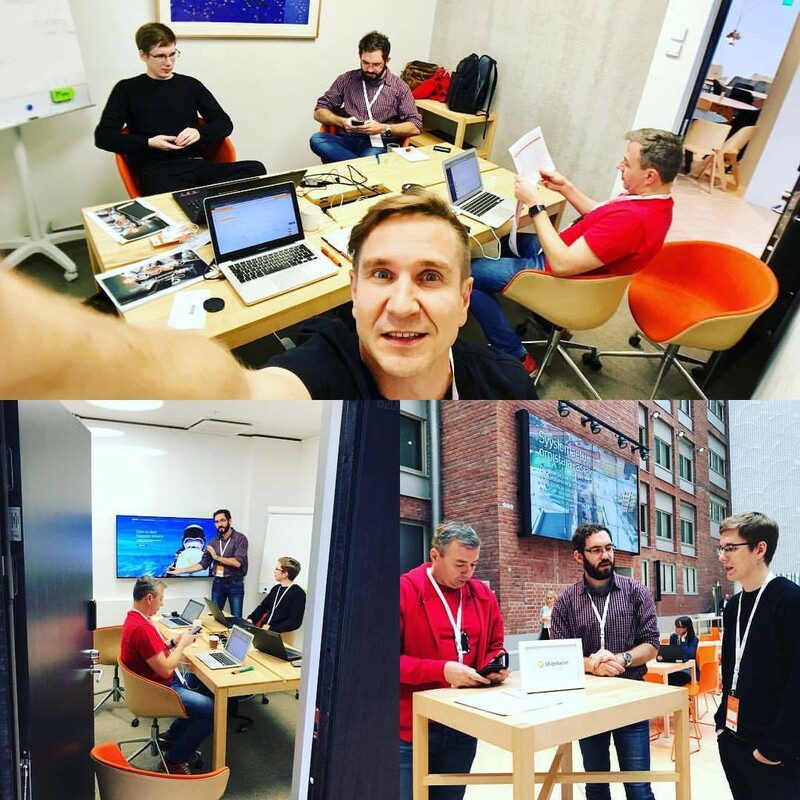 Rüdiger quickly found another opportunity at another Estonian startup called Synctuition that has developed the first binaural audio technology in the world that helps to increase intuition. Synctuition also uses Jobbatical for hiring, although in this particular case Rüdiger was in direct contact with them. 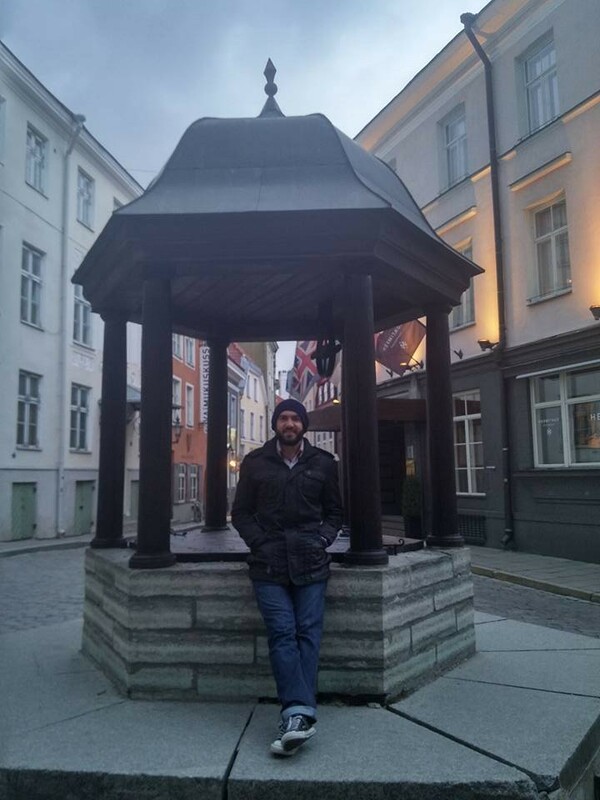 Rüdiger striking a pose in the Tallinn Old Town. Photo credit: RR. So, what will the future bring for this South African? Any advice for people considering going on a jobbatical? “Don’t overthink it. That’s made the experience much more fun for us. Have a back-up plan so that you can have ease of mind. And try to say yes to new experiences. Go for it full force and assume that you’ll need your backup plan, that makes you more open to go for the new opportunities — doesn’t matter how hard you’ll fail, this is a safe time period to experiment with life. Don’t be afraid to take the very weird and strange leaps, you have a back-up plan to fall back on. You probably won’t die,” says Rüdiger as he lets out a comforting laugh. Want a job in Europe? Check out the best companies to work for in Estonia and start applying for jobs today.